A year in the Bible without quitting? Thankfully a Bible study last year with group accountability got me to finally make it through Numbers and Deuteronomy 👏🏻! After that study (over Moses) ended, I was intrigued enough to read through Joshua, Judges, Ruth and 1 Samuel on my own, at my own pace, but I hungered for a way to read the whole Bible in a way that would not cause burnout and would make me do it in a year or less. Being the genius 👀 that I am, it was still a few weeks before the light bulb went off 💡and I looked for a Bible reading plan in the Bible App 📱. I started back in Genesis in November–I’m a little OCD and needed to read it from the beginning in order. Fast forward to tonight (Day 136), 👣👣👣👣and I’m in 2 Kings and John. So what’s different this time? Why am I actually sticking to it FINALLY? ✝ I regularly ask God to make me hunger for Him. ✝ I picked out a Bible to be the official Bible for this read through and I Mark it up like a text book. It also makes it fun to be able to see my progress. ✝ I have friends who keep me accountable simply because we always talk about what God is revealing in our lives. ✝ I feel different and have noticed a change in my view of the world the more I spend time in the Word. ✝ My plan lets you start from the beginning any day of the year (so I could start then, not wait until January 1st). ✝ Because God decided this was the year I would do it. That’s the real reason. The others are just ideas to motivate me to stay excited. Have you read the whole Bible recently? If not, why not jump in now? There are many options, some take a few years, some read the whole Bible, others take you through the highlights. There are so many options! I’m sure there’s one for everyone. Click here to open my plan in the Bible app. The man’s story in scripture ends with the him spreading his testimony (verse 20). What an important moment this is. While those of us who are passionate about our faith may think we are supposed to drop everything and follow Jesus, that is not what we are called to do. We are called to follow Jesus and share Jesus in our everyday lives. That may mean God calls us to be in the classroom, or in an office job or somewhere else. If every Christian became a priest or minister, the world would fall apart. In a sense, Jesus needs His non-clergy ambassadors out in the world, loving and serving His people who don’t yet know Him or who haven’t yet chosen Him. We are called to live in faith and sharing our faith wherever God calls us. But we are not all called in the same way nor place. After a decade of complacency, I am on fire for Jesus. I’ve even thought, “should I look at working in a Christian-based job?” But then I remembered a blog post I did in the past after the Newtown massacre. People were blaming the lack of God in schools. I clarified that God is still in schools because there are believers in schools trying to extend Christ’s love, grace and mercy to our students, parents and colleagues. I was clearly called to be a teacher. My mother even said I wanted to be a teacher before I could possibly know what one was. That’s a true calling. There are times where I want to walk away, but for now, I can see that there is a place for God to use me in my school. While it may seem easier to spend all my time with other followers of Jesus, I have to engage my world and help create more disciples (Matthew 28:19). But if you are struggling at work, my church recently did a series of sermons called “Made for Monday.” It was extremely impactful to me as it emphasized that when we view our jobs as our calling, we can get more satisfaction from them and more easily accomplish God’s will. If you are unhappy in your job or just need some inspiration in it, I highly recommend you watch the series here. If you are struggling with faith, I have been there. I’ve always believed in God & Jesus. I have not always trusted. I remember taking a spiritual gifts survey in college and being shocked that faith was my number 1. I was like, “but I have so many doubts!!! !” I lived a life believing in God and never trusting in Him. That is NOT how He wants our relationship to be. While I’m no expert, here’s what helped me grow my faith to where it’s deeply rooted like the seeds in the deep soil. 1️⃣ I spend time daily in the word. 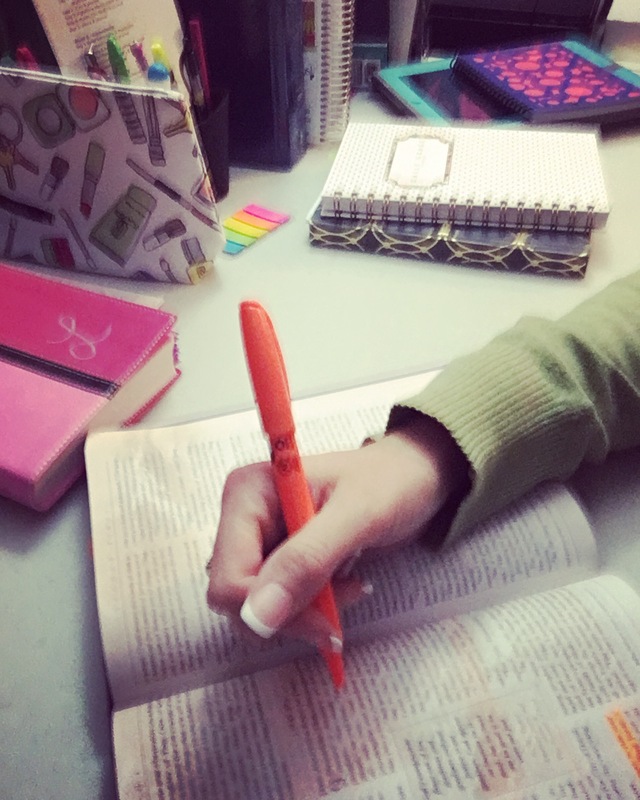 I did not know where to begin, so I joined a Bible study–BSF. I started out with only 10 minutes a day. While the 10 minutes helped to an extent, I’ll be 100% transparent and share that it was not until I started spending an hour a day that I began to not only grow in faith but also see positive changes in myself. 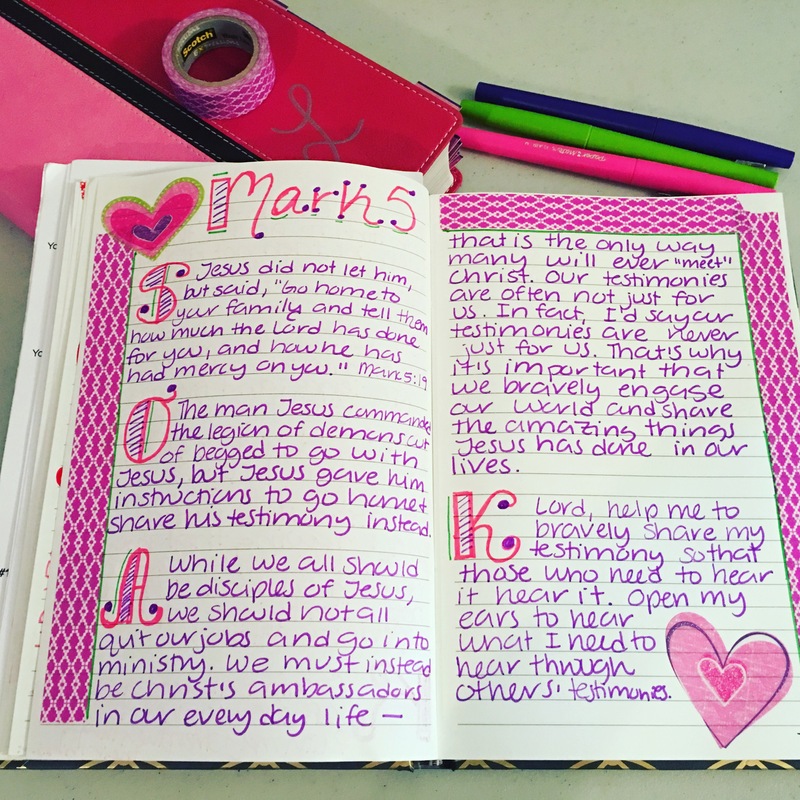 I now spend an average of an hour reading the Bible, journaling and praying over it. Some days it’s 2 hours, others only 30 minutes, but outside of church and Bible study meetings, I spend about 7 hours a week alone in the Word. Please do not be overwhelmed by this. Start small and adjust as needed. This is what I need in my current season on life. 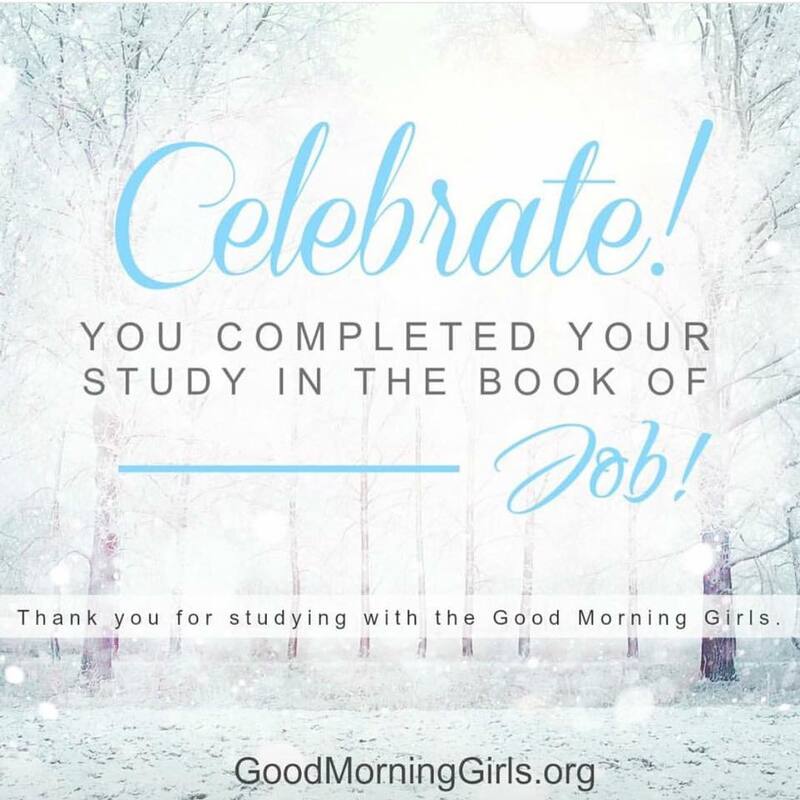 2️⃣ I joined multiple Bible studies both in person and on line. I would recommend finding one where you feel comfortable talking and sharing–you should not feel that there are right or wrong answers, you should feel you can be open and honest. Fellowship with others helps us process what God is trying to show us. We can only do so much alone. If you are in a group and don’t feel you can be your whole self, I would try some other groups. I have been in both kinds. 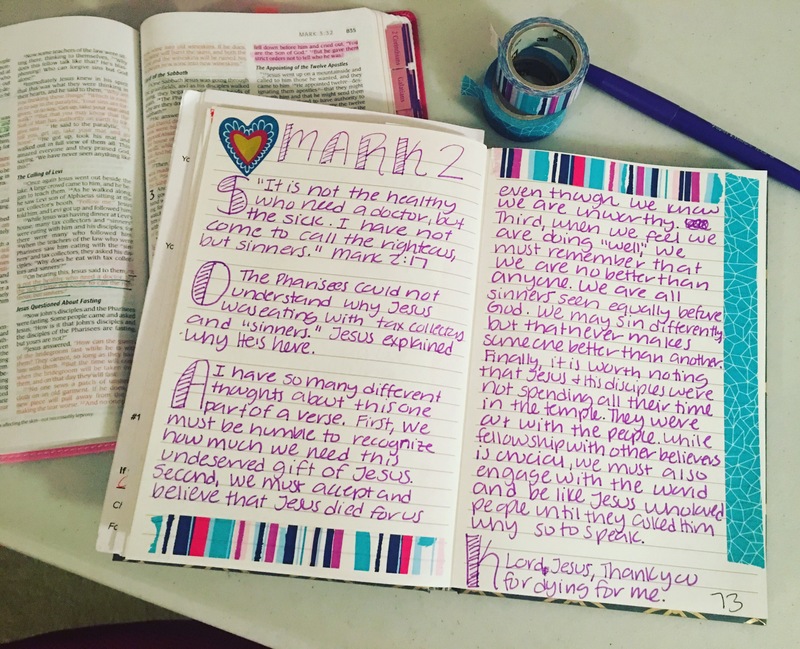 While I still learned a lot about the Bible from the “right answer, everyone pretend all is perfect” groups, I did not feel it helped me grow as much or contribute as much. 3️⃣ When my faith was tested, I put feet to my faith. I used to fly all the time, no problem, no fear. I even flew back from Spain on a flight that was turbulent for 7 of the 9 hours and still flew without issue. Then on a flight back from my friend’s wedding, I had a panic attack. This led to a flying phobia that limited my world from 2007 to 2015. I knew that flying last fall was my opportunity to show God that I trusted Him–and He got me through it. 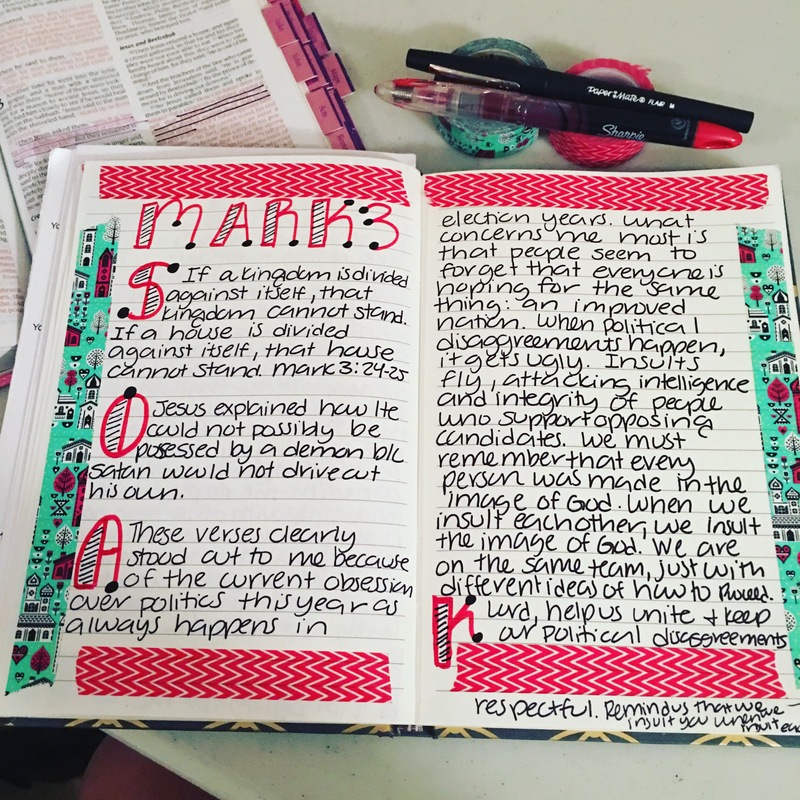 I had 2 turbulent flights during which I listened to worship music on repeat and worked on a Bible study that I bought specifically for the flights. God even placed a kind woman next to me who talked me through the first take off. What you may not know is that I flew in 2014 and it was not great. My dear friend was convinced that God would use those flights to get me over my phobia and grow my faith. BUT, I was not trusting God. I wanted Him to do just that, but I did not trust Him to do it. Faith means nothing without action. It was a disaster. I did not trust God, I wanted to, but let the devil play on my every fear. After that experience, I was terrified about trying again. Nevertheless, this time I was ready to rely on God as I had already been doing for months. When I chose–free will, man–to depend wholeheartedly on God, I felt Him with me. He got me through those flights and I had a moment of clarity. I wondered, “was the devil limiting my world so that He could limit what this outspoken women could accomplish for God?” Only time will tell, but I have my suspicions. 4️⃣ I found a church home that feeds me weekly. I loved the church I grew up in. I still do. It’s 40 minutes away and hard for us to participate in anything but church on Sundays. After being invited for almost a year, I finally attended my new church home for a women’s conference after listening to all the sermon podcasts while driving back and forth to work. The church you attend will impact your faith. My new church is a place where we feel welcome, expected and are encouraged to be 100% ourselves. I know I can share any struggle and I will receive love, prayer, encouragement and support without judgment. I’ve never felt that way about church before. It’s amazing how a year or even 6 months can change everything. It’s amazing what God can do during that time. A year ago, I spent maybe 10 minutes a day with God. Now, I work on my relationship and faith everyday. I give all glory to God in the highest for the words of this and every post and for not giving up on my despite my lifetime of complacency and lack of trust. I pray for you who reads this that you have faith like the seeds in good soil and that if you don’t, God helps you put feet to your faith so that you too will experience His awesomeness. Mark 2 gave me lots to think about! 1️⃣ We must humbly recognize our need for Jesus. 2️⃣ We must accept and believe that Jesus died for us even though we know and feel our unworthiness. 3️⃣ When we feel we are doing “well,” we must never think we are “better” than anyone else. We are all sinners, sometimes we go through seasons of big time sinning and other times we go through seasons of small time sinning. No matter what, we are all sinners and should never feel superior to anyone. 4️⃣ Finally, it’s worth noting that Jesus and His disciples were not just chilling in the Temple interacting with only believers. They were out engaging their world. While fellowship with believers is crucial, we too must go out in the world and engage people. We need to love them as Jesus would until they ask us why. 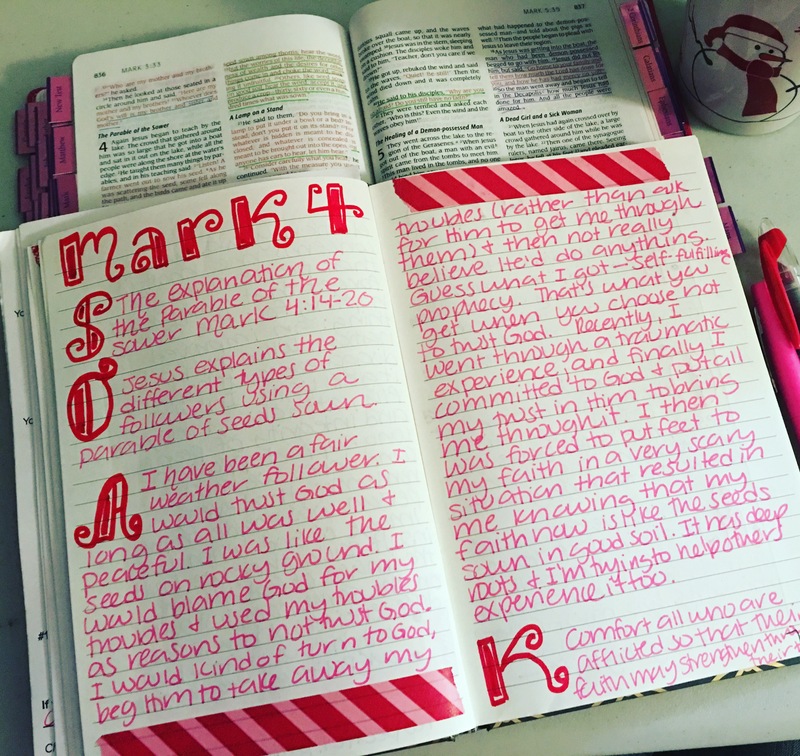 I recently read Mark as a part of my year read through the entire Bible, though I did not pause to SOAK it like we are now. As I expected, there were so many verses I could have chosen to write about–I was a bit overwhelmed after Job where I often struggled to connect to even 1 verse in each chapter. The one I chose this read through Mark 1 is verse 35 because I am on a mission to be more Christlike. 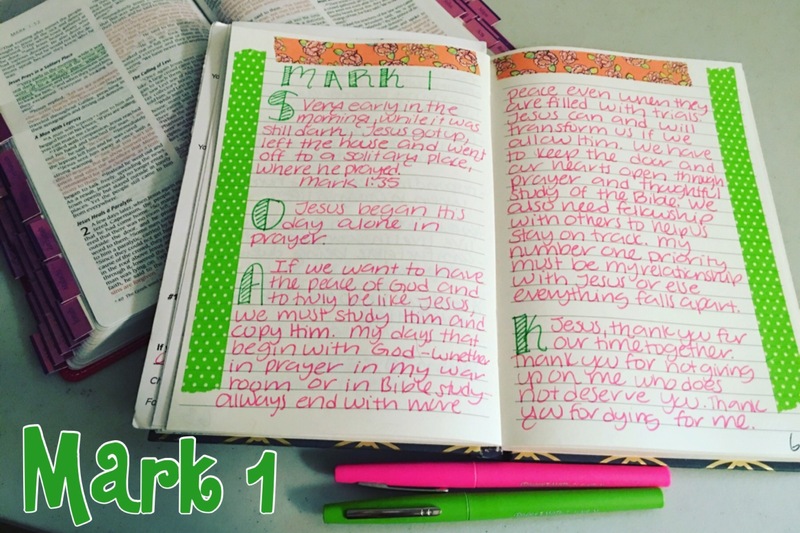 In this first chapter we see the importance of prayer/Bible time as Jesus started His day in prayer. We should all strive to be like Christ, praying, loving, serving, caring for others. We are some people’s only glimpse of Christ and while we cannot ever be perfect, we have a responsibility to others to help them see Christ so they will recognize their need for Him and want to be His. If we want to be successful fishers of men (verse 17), we have to be like Christ. Plus, our time in the word transforms us. I can personally attest to this based on my experiences in the last year in my walk with Jesus. 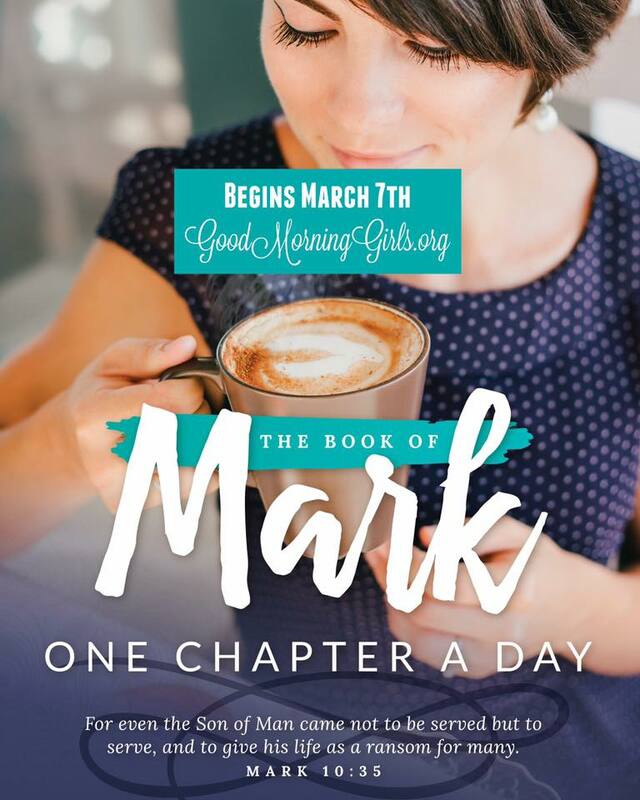 Mark – Starts March 7th! I’m so excited for this! After Job, I’m ready for some Jesus! 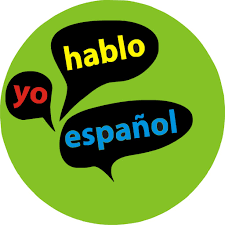 Are you in an online group? Do you want to start one? I’d be happy to help you get started. Ideally groups are no more than 25 people. You read 1 chapter a day Monday-Friday using the SOAK method. S-Scripture (pick a verse or 2 from the chapter that stood out to you). O-Observation (what is happening in this section). A-Application (how does this verse apply to you right now, why do you connect with it, any other thoughts). K-Kneeling in prayer (write a prayer that can relate or not). This is a simple method of digging deeper and all you need is access to a Bible and paper or a journal. If you want to see examples from Job, go on Instagram and search the hashtag ‪#‎GoodMorningGirls‬. You don’t have to have a group, but it makes it more fun and meaningful. The most compelling part of the lecture was the end, when she suggested that, “The greatest injustice in this world is the way we treat God.” Talk about convicting! He created the world, He created us. We must honor Him, thank Him, ask for forgiveness for our sins. So much of the world chooses to ignore Him. I want to take this even further, though, and say that when we don’t take care of others, we are also disrespecting God. This is what hit closest to home for me personally. 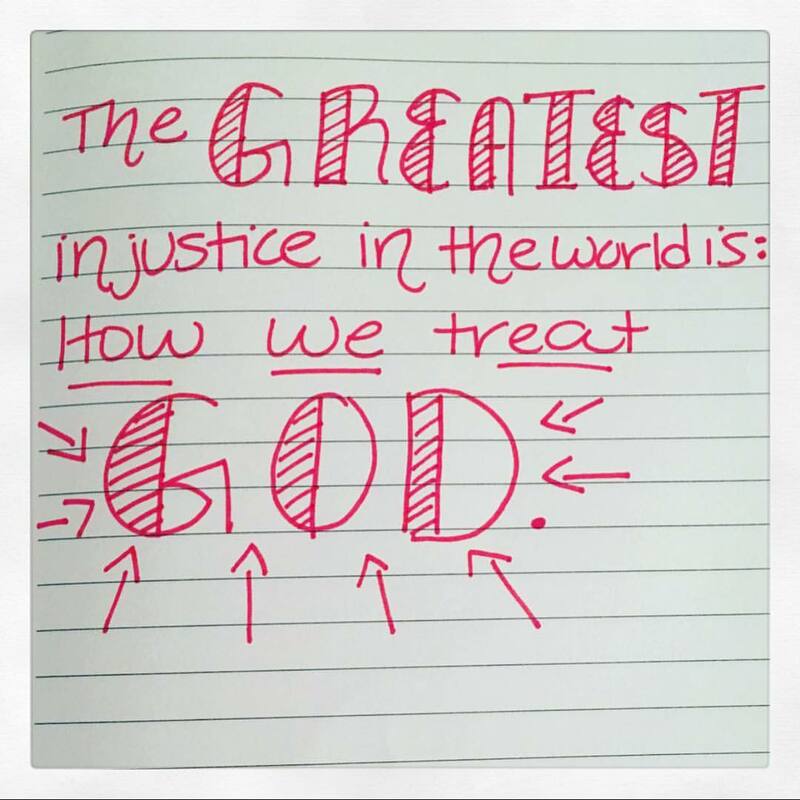 When we live selfishly, we are showing injustice to Him. The Bible is clear that we are to care for those who cannot take care of them. How much more could I do? A lot. We are selfish, we must change. I want to do more for others. I’m saving money right now, dialing down debt, and when that’s done, I cannot wait to use God’s money to help others. If we all did a little–I’m not just taking financially–if EVERYONE did a little, we could take care of everyone on the list above and at the very least stop the injustice we show to God. So for now, I’m praying for God’s wisdoms to show me where He wants my service and my money. ❤️ When we have an issue, we should talk directly to God, not about God. ❤️ God shouts in our pain. ❤️ Times of sorrow are opportunities to have the most spiritual growth. ❤️ When we mess up, we must humble return to God and ask for forgiveness. ❤️ God allows trials to help us grow. Whether we grow or not, is dependent on how we choose to handle it. Choose to rely on God. The most important thing I truly learned through the study of Job is that the greatest opportunity for spiritual growth is in times of trial. When the study began, I was at the tail end of the depression phase of the stages of grief. I thought anger was hard, depression took the cake. It was extremely hard to go through Job’s pain at first. But God shouted to me through my pain and it was awesome! So much beauty has come out of one of the hardest seasons of my life, the greatest being my growth in faith–not just the belief/feeling, but the acting in faith. I now put feet to my faith and trust God completely! I’m no longer a slave to fear. I got on a plane and now no longer have my flying dreams, even my elevator-in-tall buildings nightmares that I had weekly forever have stopped. I stress less on ramps and bridges. My world has changed. While in that depression phase, I was forced to put feet to my faith, and I’m so glad because God shouted that He was with me and my faith is my strongest attribute. The study of Job was timed perfectly as I transitioned to acceptance of my new normal and through this, my faith has been solidified. 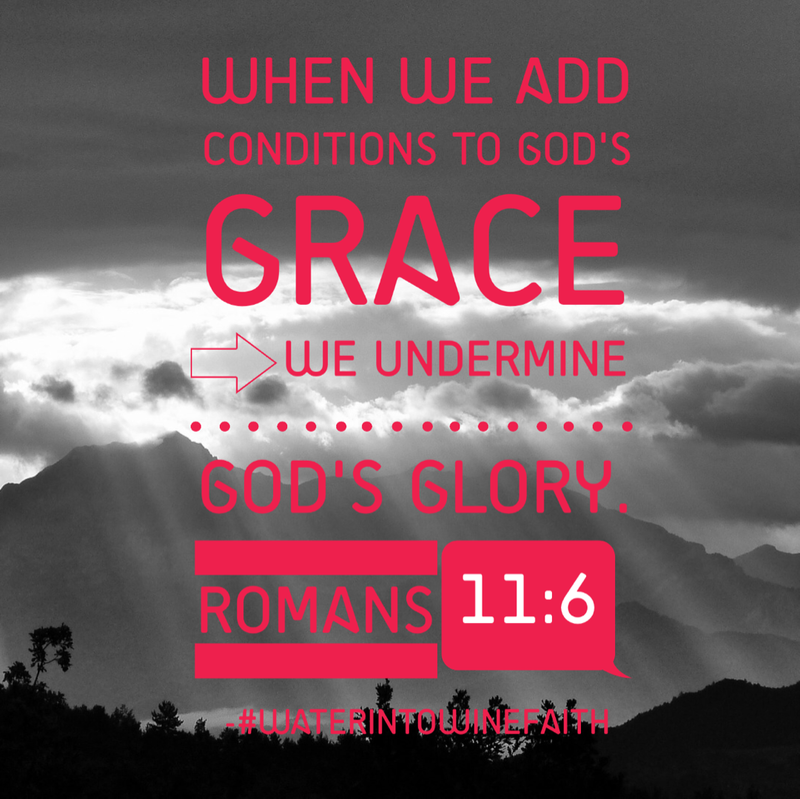 God’s grace is so simple, yet completely unfathomable. Yes, you can make the worst choices in life and Jesus will still welcome you with open arms if you choose Him. You can live an entire life in sin and realize your mistake on your deathbed and still have time to choose Jesus. Is it fair? No! Is it fair that Jesus who was sinless had to die on the cross to reconcile us all to God? No! Jesus died for each and everyone of us knowing that we aren’t perfect and that many of us would not choose Him in the end. He loves us whether we choose Him or not. And so it is the same with God. God’s grace is generous beyond anything we can imagine. So, yes, there is a chance Hitler is in heaven despite all the evil he unleashed in this world because if he did repent and choose Jesus in the end, God’s grace would apply to him too. That is perhaps the toughest pill to swallow as a Christian. But that’s how God’s grace works. Nothing about being a Christian is fair except this: God loves us all the same whether we love Him back or not and He offers us all the gift of grace through Jesus Christ no matter our sin. Could it be any simpler? I do want to add something in anticipation of comments. I do not believe you will find a true believer who blatantly sins for fun and says, “I can do whatever I want because Jesus is my savior. It’s my get out of jail free card.” Perhaps a few exist, but that’s between them and God.